We highlight the most significant developments. IF YOU had been in your 20s at the time of The Plain Truth's inception in 1934, you would have lived your adult life during a momentous time in the world of religion. In the past half century, several great events and issues of the day have centered, in whole or part, around religion. Had you been a Plain Truth reader during these five decades, you would have been kept abreast of those developments — and their significance in Bible prophecy. As the first issue of The Plain Truth made its bow, a special Holy Year was underway in Rome. It was proclaimed by Pope Pius XI to commemorate the 19th centenary of the Crucifixion (A.D. 33 by official Catholic reckoning). During the 50 years that were to follow, you would have witnessed momentous changes in the Roman Catholic Church. By the end of this eventful period, a revitalized Vatican would be flexing its muscles as a major power in the international arena. The unprecedented, globe — girdling journeys of Pope John Paul I I and the pontiff's repeated calls for a united Europe would spotlight this trend toward a greater Vatican role in world affairs. Also during this half century, you would have seen a modern-day ecumenical movement under way. This movement toward church unity would be given impetus by the second Vatican Council (1962-65), called by Pope John XXIII to "renew the Church" and provide an occasion for Christian churches separated from Rome to join the search for reunion. The quest for One Church — a united Christianity — would become a major theme of the Catholic Church. You would have had the background to all this in The Plain Truth. You would also have seen Judaism come onto center stage in a major way during this period. In 1934 the infamous Holocaust, the Nazi slaughter of European Jews, was beginning. Out of this horror would spring the modern state of Israel in 1948, fulfilling major biblical prophecies. The headlines of your daily newspapers would have told you of other religions in far-flung parts of the world suffering similar persecutions — foreshadowing a time yet ahead of unprecedented horrendous atrocities, including a prophesied great martyrdom of true Christians, as The Plain Truth has explained. Most recently, the oppression of the Bahai community in Iran would grab the attention and sympathy of the world. In the United States and many other Western countries, you would have read of a steady downtrend in church and synagogue membership (percentage of adults who are members of a congregation) during the past five decades. Dwindling congregations would be attributed to growing materialism and the failure of institutionalized religion to be "relevant" in the modern world. At the same time, you would have witnessed a much — publicized period of increasing strain between Church and State in the United States, fostering what many would see as an erosion of religious liberty in America. In contrast to declining church memberships in the West, news reports would have told you of an opposite trend in the Moslem world. Islam would become the world's fastest-growing religion (see chart). By the late 1970s, for example, one of every two births in the Soviet Union would be to Islamic parents! By the early 1980s, Islam would be the religion of more than one fifth of humanity, second only to Christianity. It would be the dominant belief in some 40 countries. The rise of an Islamic fundamentalist movement would be reported across the Middle East — a reaction to Western mores and values that contradict the principles of the Koran. The biggest triumph would be in Iran, where a revolution would install a Shiite regime in 1979. The Plain Truth has been there and would have told you the true story behind this volatile region. "And this gospel [good news] of the kingdom shall be preached in all the world for a witness unto all nations; and then shall the end come." This is not a gospel about Jesus but Jesus' own gospel of the kingdom of God! 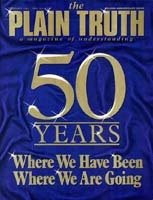 It was 50 years ago this month that this gospel began to be disseminated by way of this magazine. This worldwide endeavor is now blanketing the globe, heralding the fast-approaching crisis at the end of this age-and the soon-coming establishment of the millennial kingdom of God on earth!